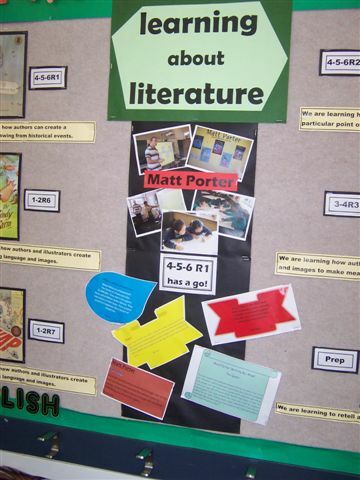 Matt is passionate about teaching writing and sharing his skills. He uses his 12 years of teaching experience to ensure every session is planned in detail, engaging for students and teaches skills that can make an immediate difference to students’ writing. Do you want to encourage your students to take more risks with their writing and for them to further develop their story-planning abilities? This session compares creating a narrative to the design of a video game; great for those reluctant writers! Students complete several levels and finish the session with a detailed story-plan they can develop into a narrative. 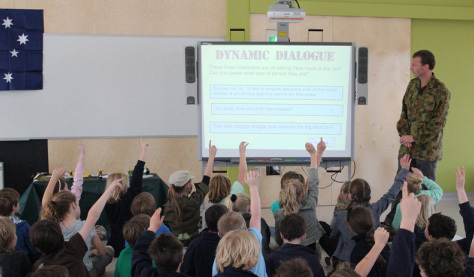 This session runs for one hour and is best suited to Year 3 – 6 students. A session for students who love footy, writing or both! Students select various activities to complete from a football oval with all writing being footy-inspired. Several hands-on activities are part of the session. Oh no! A student has dressed up as a teacher, marched into their classroom and made their classmates complete their homework. The session begins with a student being accused of impersonating a teacher, charged and sent to trial. The session revolves around preparing the court case. The session finishes with students dressing up and becoming members of the court as the trial is played out. The trial also gives all students the opportunity to share their writing from the session. Come on down! One lucky student is selected to don a golden jacket and perform the role of Mr or Mrs Jackpot for the session. The student host displays their gameshow moves while a voiceover plays and recreates a gameshow entrance to theme music. Co-hosting the session with Matt is the student’s next role as the rest of the group play a variety of entertaining and educational gameshows. Want to teach your students the elements of a narrative and how to plan their own stories? Well, this is the session for you! Students act out the main events of Mr Sergeant and the Dodgeballs of Doom and then identify the setting, characters, problem, action to solve the problem, ending and theme. Together the class are then presented with the task of planning a narrative, with the help of Matt. The narrative is set in the students’ school and the problem? The Mischief Man has sprung characters to life from books in the school library. With the help of their main character (a student dressed as a superhero) the group plan what mischief the characters will cause and how to finish the narrative and defeat the Mischief Man. Students don’t want to simply hear about inventing interesting characters, they want to see their peers dress up and be the characters! This session takes students through the creative process of creating a captivating character. Each step is demonstrated by a student dressing up as one of Matt’s Crazy Relief Teachers. Students will then be given an overview of creating captivating characters and then placing that character into the perfect plot. A writing workshop that teaches advanced writing skills to students. Students will be taught the steps to create a captivating character and then develop a plot. The session also covers many writing skills used by authors. The workshop allows time for students to practise each skill in fun and engaging activities. When the session finishes each student will have a well-developed character and the plot for a narrative. A fun session aimed at multiple year levels. The beginning sees the students informed that Matt’s computer has been hacked and Mr Jackpot has stolen all the books from the Crazy Relief Teachers series. The students must visit seven different stations, each involving different codes, mysteries and tasks, to determine where Mr Jackpot has taken the books. Stations include code-breaking, finding a hidden message in a picture, locating a hidden message in a seemingly normal book and even searching through Mr Jackpot’s fan mail! The session finishes with students dressing up and holding a humorous court case with Mr Jackpot going on trial. 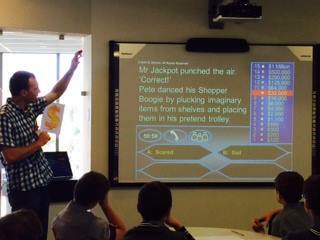 Students test out their knowledge of books by competing in a range of games, gameshows and book-related challenges. A wide range of games are played, allowing for students with different learning styles to achieve success. Games include finding characters in an illustration, charades, Celebrity Book Head, The Rich List and Family Feud! Games can be played individually or in teams. 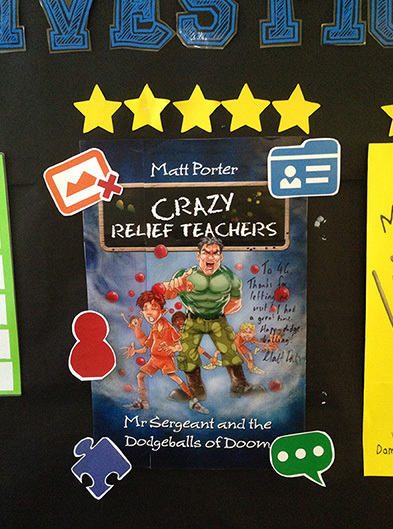 Matt will take your staff through a variety of fun and interactive ways to teach writing. He will demonstrate skills that are easily taught and can make an immediate difference to your students’ writing. Sessions can be tailored to suit your staff’s needs or can cover a wide range of topics such as dialogue, creating captivating characters, planning a narrative, engaging reluctant writers and many other areas. Matt loves making new activities to teach skills. Let him know what you want taught and he’s happy to develop a session tailored to your students’ needs. The feedback from the students was amazing. They all seemed to really enjoy listening to you talk and the Crazy Relief Teacher series has been flying off our shelves this term.We will definitely be asking you to come back and visit again. On behalf of all of the staff at Sacred Heart School and the students who were in attendance yesterday, we would like to say a big thank you for your very engaging and interactive workshops. They were absolutely fantastic. The students are raving about you and are already drafting and re-drafting their writing pieces. There was a real buzz at our school during and after your session. We look forward to reading more of your work and practising the writing skills you taught us. Matt's writing workshop grabbed the students' attention from the beginning. There were plenty of opportunities for participation as opposed to just sitting and listening. He managed to engage ALL students and it was fantastic to see them applying his writing tips during the session. Matt's passion for writing and teaching was evident in his entertaining and informative session. The students were enthralled and totally engaged during the entire session which catered to all abilities. His activities and tips achieved immediate results and the kids were soon writing far more descriptive and exciting stories. I highly recommend the sessions. Matt Porter presented an engaging and entertaining writers workshop for my Grade five and six students at Bannockburn Primary School. He gave the students some excellent strategies for extending their creative writing, building character profiles and writing with greater expression. His Interactive Whiteboard presentation was very professional and gave students a humorous glimpse of Matt's writing process. 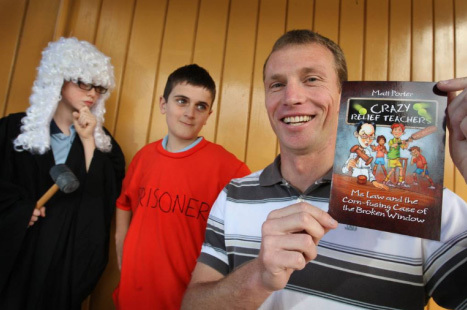 Thank you Matt for a wonderful author visit – your informative, engaging and entertaining presentation was a Book Week Highlight for our students. They will be looking forward to future Crazy Relief Teacher instalments. On behalf of the kids at Jamo, I would love to say a very big thank you! The kids thoroughly enjoyed your game show theme and were very motivated to write in between contestants. The books that we purchased from you are already been shared around our students who are really enjoying reading them! We can't wait until you release your next novel and you tour again! An excellent spokesperson who involved the students from the moment he entered the room; providing costumes, music and an interactive slideshow, Matt had the students enthralled from the outset. Never have I seen the students so enthusiastic about starting a story as when Matt asked them to write the entrance of a main character. Two examples were read out and were quite hilarious. This was both educational and entertaining for the students and a great refresher of techniques for me. I’ve never seen my students so engaged.